Yesterday, I was covering an “augmented reality floor”, that was really more of a floor that could replicate whatever texture you wanted to. Yes, I am serious. Read that one here if you don’t believe me. Now, here is another unusual floor for those who need to have a room that I would like to describe as “versatile”. 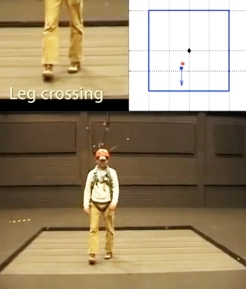 The Cyberwalk is actually more of a platform to work an omni-directional treadmill. You might wonder why in the world anyone would want an omni-directional treadmill, but most of the reasons boil down to recreation. Just imagine if you want to run inside, but you don’t want to run in place or in one direction, like on a regular treadmill. You are free to run anywhere. I think there might be a limitation to this technology, though. Most pictures that I see of this show someone with some sort of support. I can see why. It looks like the Cyberwalk might be very difficult to maintain one’s balance on. Another application is gaming. Just imagine a Massively Multiplayer Online (MMO) game where the player does not move with the A, S, D, W or arrow keys, but by just moving his or her feet. Attach some motion controllers to the arms, and you’ve got yourself a very interactive gaming environment. Sadly, this guy is just research at the Max Planck Institute for Biological Cybernetics in Tubingen, Germany. I’m guessing it would be expensive to set up in an ordinary home, but what a ride it would be to have this. Star Trek used an augmented virtual reality simulation holodeck program to create any scene and you walk around room thinking your walking miles but it could be this with virtual reality technology combined and BAM, you have Star Trek holodeck lol!